This article was submitted by Dan Bottom, a current Howard L. McKee Ecology Resident at Sitka. Dan is a fishery research biologist who worked in state and federal government for 38 years, including 22 years with the Oregon Department of Fish and Wildlife in Corvallis and 16 years with the National Oceanic and Atmospheric Administration in Newport, Oregon. His research interests include salmon, estuaries, and environmental history. He helped to initiate a long-term study of the effects of wetland restoration on salmon populations in Salmon River estuary, home of the Sitka Center of Art and Ecology. Dan retired from federal service in 2016 but continues serving as Courtesy Faculty at Oregon State University and as a technical advisor for a large habitat restoration program in the Columbia River estuary. Twenty years ago, our research team from the Oregon Department of Fish and Wildlife and the University of Washington began studying juvenile Chinook Salmon in the Salmon River estuary. By that time, scientists were well aware that estuaries are among the most biologically productive ecosystems on Earth, and Chinook are among the most estuary-dependent of Pacific salmon species. Yet Salmon River offered new insights about salmon and estuaries at a critical time. In 1991 a landmark scientific paper had identified more than 200 Pacific Northwest salmon stocks in serious decline or at risk of extinction. A year later Chinook and Sockeye Salmon in the Columbia's Snake River basin were listed under the Endangered Species Act, and petitions for many other salmon stocks in the region came under federal review. The Oregon legislature responded by funding a new Oregon Coastal Salmon Restoration Initiative in 1997 to improve watershed conditions and avoid the addition of coastal Coho Salmon to the expanding federal list of threatened or endangered species. By 1998, when Oregon Sea Grant agreed to fund the Salmon River Study, the breadth of the "salmon problem" was obvious. The contribution of Oregon estuaries to the problem (or its solution) was not. Scientists had long known that juvenile Chinook Salmon reside in estuaries for weeks or months before migrating to sea. Surveys in British Columbia and Washington estuaries in the 1970s revealed that many juveniles use tidal marshes as rearing habitat. Most Oregon tidal marshes were "reclaimed" for agricultural use or other development long before their importance to salmon and other wildlife was known. Regardless, estuaries and salt marshes never were a priority of salmon conservation: resource managers had always assumed that the abundance of salmon depended entirely on survival during their earliest fresh-water life stages. The Northwest salmon crisis exposed the failure of conventional assumptions in fisheries management. It drew attention to the other environments salmon need to complete their life cycles, and raised new questions, for example, about their habitat requirements in estuaries: what about all those diked tidal marshes? 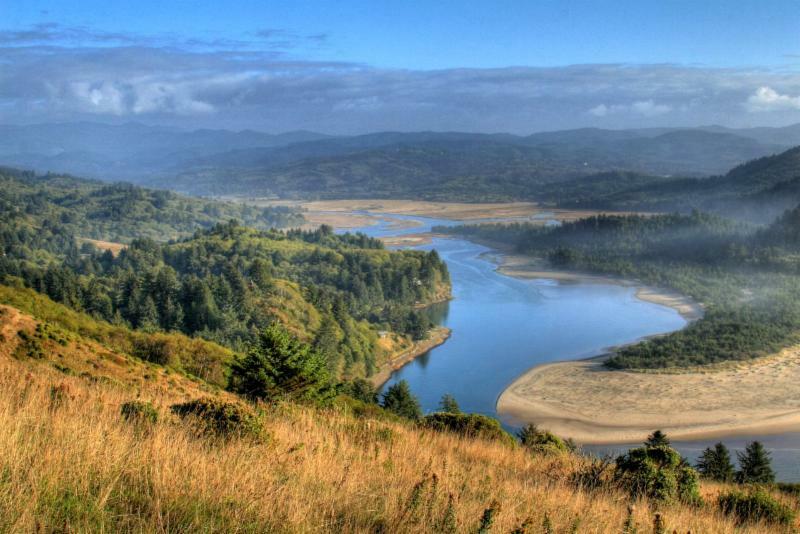 The Cascade Head Scenic Research Area established by Congress in 1974 protected the Salmon River estuary from future development and created a unique natural laboratory for the study of tidal marshes, salmon, and the effects of estuary restoration. Management of the Scenic Research Area directed the removal of dikes and tide gates that had converted most of the estuary's tidal marshes to grazing land in the early 1960s. It just so happened that the U.S. Forest Service-the agency charged with managing the Scenic Research Area-restored a large salt marsh every nine years. By 1998 a series of Forest Service restoration projects had inadvertently created an ideal experimental landscape consisting of a reference marsh (the only tidal marsh that was not previously diked) and a series of restored tidal marshes of varying recovery ages-2, 11, and 20 years since dike removal. Our research began by asking two simple questions: (1) if a salt marsh is restored, will salmon come? and (2) if they come, will they benefit, either immediately (soon after a dike is removed) or gradually (reflecting the time elapsed since dike removal)? The fish indeed came. Within a year of the 1996 dike removal project, we found a full complement of estuarine fish species, including juvenile Chinook and Coho Salmon, occupying the newly accessible marsh channels. Surprisingly, salmon use did not increase with wetland recovery age. Chinook abundance in the most recently restored site frequently exceeded salmon abundance in the other wetlands. In contrast, the marsh with the longest recovery period (20 years) consistently had the fewest salmon. We concluded that recovery age of each marsh was less important to salmon than its geographic position along the salinity gradient or its accessibility to fish from the main-stem estuary. For example, the 1996 restoration site was the first large, off-channel rearing area available to juvenile salmon entering the estuary from upriver. The abundance of salmon at this site likely reflected its function as a transitional refuge for upriver arrivals, allowing individuals to adjust gradually to the estuary's fluctuating tides and salinities. In contrast, the consistently low numbers of salmon at the oldest restoration site may have been caused by a sand bar near the entry channel that impeded fish access to the marsh. Each marsh, regardless of its recovery age, produced a diversity of insects and other invertebrates that directly supported salmon feeding and growth. The period of marsh recovery influenced the species composition of the marsh vegetation, the width and depth of the restoring marsh channels, and the particular kinds of invertebrate prey available to salmon. Again, the effects of marsh recovery age on salmon feeding and growth were often unexpected. For example, the death and decay of established pasture grasses immediately after the dike was removed caused a productivity boost of high-energy prey that supported juvenile salmon in the most recently restored wetland. Overall, a succession of estuarine marshes of varying recovery ages established a diverse array of prey types and feeding opportunities for juvenile salmon across the entire estuary. In 2004 and 2005, we compared salmon in the most recently restored wetland with those of the reference marsh, and detected no difference in their average growth rates. Our first phase of the Salmon River Study clearly demonstrated that dike removal immediately creates productive rearing habitat where juvenile Chinook Salmon feed and grow. The next question is whether habitat improvements in the estuary contribute to the survival and return of Salmon River adults.